Take potatoes in a bowl, add breadcrumbs, cornflour and salt and mash together with a masher. Fill the mixture in a piping bag. Line a tray with parchment paper and pipe out sticks on the paper. Keep the tray in the refrigerator for 2 hours. Heat sufficient oil in a kadai. Gently slide in the sticks into the hot oil and deep-fry till golden brown and crisp. Drain on absorbent paper. 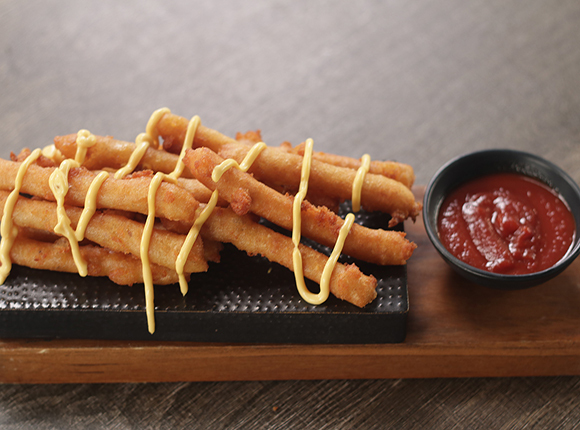 Arrange the sticks on a serving platter, drizzle mayonnaise over and serve immediately with tomato ketchup.